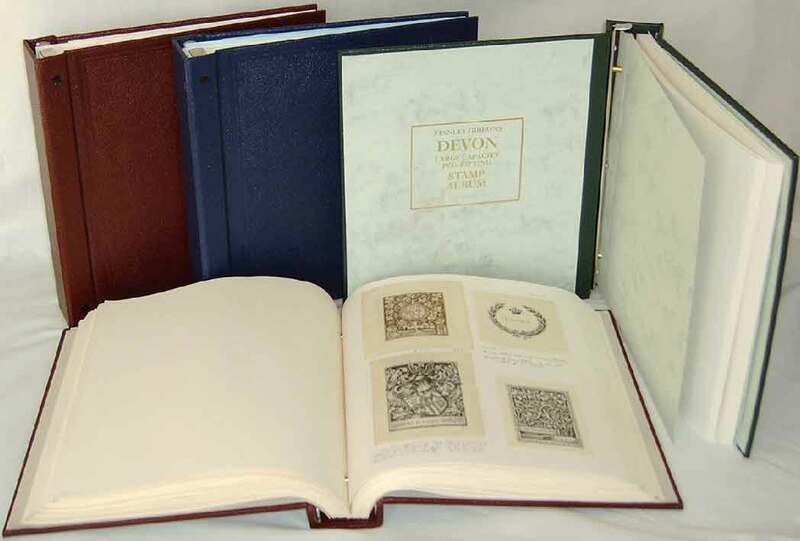 A number of collectors mount bookplates in Stanley Gibbons "Devon" loose-leaf binders. These albums, available in maroon, dark blue and dark green (but no longer in black), may be ordered from the Society. An album with 50 sheets of squared paper costs £33.95 (retails at £39.95) plus postage. Each pack of 50 extra leaves costs £9.50 (retails at £10.95) plus postage. Ex-VAT prices may sometimes apply for destinations outside the UK. To order, or to confirm the cost including postage, please write to the membership secretary (see Contact Us page). The microfilm (10 reels) of the British Museum's Franks Collection of 36,000 British and American bookplates has been available at $1,600 from Mr Felix Moore, Mindata Ltd, Bathwick Hill, BATH BA2 6LA Tel: +44 1225 466447 Fax: +44 1225 482 841 Email: mindata@onetel.net.uk We may sometimes be able to find this microfilm more cheaply from members who have retired from collecting. Other microfilms available from Mindata include the Banks Collection of Trade Cards (6,000 images; 19 reels) and the Sir Ambrose Heal Collection of Trade Cards (16,000 images; 27 reels). We are sad to have lost Claus Wittal of Wiesbaden, who died of cancer on 18.9.2012, aged only 57. His wife Margo continues the business (see above). Another German dealer, Ernst Deeken of Altenlotheim, is also no longer with us. Bookplate Ink, run by Karen Gardner (kgardner@bookplateink.com Tel: +1.866.483.3830) also offer printing of custom designs. Most designs were acquired in the 1980s from Antioch. Antioch Publishing Mass-produced bookplates (unpersonalized) for retail sale, primarily. No longer prints bookplates with the customer's name included. Congresses, plus much other information and many links to bookplate-related websites. Dr Bernhard Peter of Koblenz illustrates heraldry in British, German, French and other exlibris. Frederick Garrison Hall, Etchings, Bookplates, Designs by Elton Wayland Hall, Henry P. Rossiter; Boston Public Library, 1972. Concerning Book-Plates, short essay by Theodore W. Koch, 1915. A Booklet devoted to the Bookplates of Elisha Brown Bird, by Winfred Porter Truesdell, Village Press, New York, 1907.